It's a bleeding of sorts, not of blood but of clay eroding from a yard that was meticulously cleared of leaves in the fall. The ground was left bare and unprotected from the impact of raindrops that loosen soil and then carry it into the street. Leaves not only provide a protective mulch for the soil and fertilizer as they slowly break down, but also provide habitat. Birds, in need of protein to feed their young, can often be seen in the spring flipping leaves over in search of the insects that live underneath. The homeowner surely thought it was the right thing to do, to blow all the leaves out into the street and have a nice tidy yard. But the result is not so tidy, neither for the street nor for the sidewalk months later. A mulch mowing, rather than a leaf blowing, would have ground the leaves up and deposited them back on the soil, where they could do some good in a tidy enough way. A friend asked for help tracking down an article on the Edgewater inferno that destroyed 240 units in an Avalon Bay complex. The article mentioned the role lightweight wood construction likely played in the fire's rapid spread. A compilation of past fires and violations at Avalon Bay facilities can be found at this link. Interestingly, Avalon Bay's Edgewater project burned down not once but twice. The first time, in 2000, adjacent homes also were destroyed. So it's not surprising that officials are calling for a review of the Avalon Bay structure to be built in Princeton. Meanwhile, Avalon Bay is finding it much harder than expected to intentionally destroy the old hospital that has occupied the site up to now. There's irony in all the effort being spent to destroy a tough old building, so that a vulnerable new one can be built. The Edgewater fire brought back memory of an article about how wood used these days, often laminate or made of compressed chips, has a lower flash point and thus allows fire to travel faster through a building. Newer furniture also tends to be made of materials that catch fire at much lower temperatures than solid wood. The idea being that fire in one room will heat the air in the next room, which will suddenly burst into flame once the flashpoint is reached. The lower the flash point, the quicker adjacent rooms ignite. 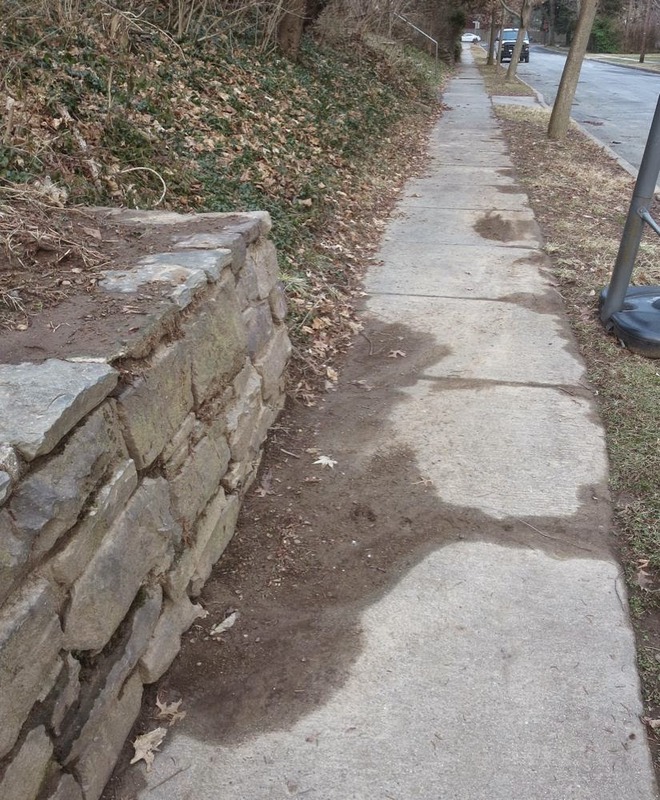 How do we reduce parks maintenance costs, energy consumption and street mess in Princeton? The Princeton Environmental Commission has been recommending for years that people make simple leaf corrals to put leaves into in the fall. These sorts of corrals are used in New York's Central Park, and I've seen them in Paris. Scarsdale, NY has a helpful video showing another way to effectively process leaves on-site in town parks: mulch mowing. Princeton could easily and economically be using its parks to demonstrate these methods, rather than, as was seen this past fall at Barbara Sigmund Park, bringing in heavy machinery to gather leaves up and haul them away. All this extra work is being seen at a time when parks maintenance is reportedly understaffed. All the more reason for Princeton's parks to be demonstrating best practices for utilizing leaves on-site. Could a committee have come up with such a great idea? If so, then it's time to rethink our stereotypes about committees. 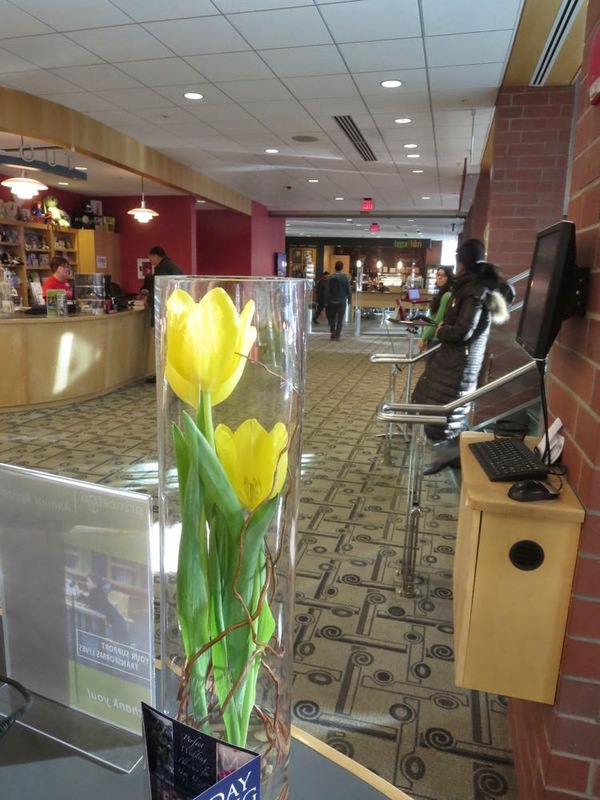 For five hours last Saturday, Jan. 10, during "65 Things @ 65 Witherspoon", the library became a living internet with live tutorials on an outrageously diverse spread of subjects. This was not the internet of annoying pop-up windows or dubious claims, but the internet that has become a channel for human generosity, a massive sharing of know-how and experience. I first became aware of this incredible outpouring of generosity when I wanted to learn to play guitar. Just an internet search away stood thousands of video tutorials showing how to play every tune and finger every note. At the library's learnathon, each tutorial lasted about a half hour, with subjects constantly changing. Walk in the front door and a magician was explaining how to mount a unicycle. A few steps further in, there was a demonstration of face painting, and then beyond that, a woman providing a tutorial in singing, while all were invited to join a drum circle forming in the library's community room. Already in the archive of memory from earlier in the day were tango lessons, and a how-to on creating picture albums. My contribution was a demonstration of a Kill-a-Watt meter--a device available for checkout at the library that you can use to measure how much energy this or that item uses in the house. I began with comparing light bulbs. An old-style incandescent used 60 watts, a compact fluorescent used 14, and the latest technology, an LED, provided the same amount of light while using just 9 watts. The LEDs have come way down in price at the big box hardware stores, last for decades, and provide quality light. Then I plugged a small fan into the Kill a Watt meter, which read 20 watts. Electricity is great for running motors. Our newer frontload washing machine, for instance, if used with detergents formulated to perform best in cold water, uses very little energy. Then I plugged in an air dryer and asked for estimates. 50 watts? 100? The hair dryer uses 1300 watts--the big jump being due to the extreme inefficiency of electricity when it comes to generating radiant heat. Things like toasters and hair dryers fortunately are used only in short bursts. An electric clothesdryer, however, can be on for an hour, while steadily consuming 4000 watts of energy during that time. To measure a clothesdryer's energy use, it's necessary to have a whole house energy meter, which can cost a couple hundred dollars but is worth considering. Getting immediate feedback on energy use makes much more real the consumption that is otherwise hidden in a monthly bill with lots of small print. It led us to get clothes racks and use the clothesdryer only occasionally. 65 Things vanished as quickly as it appeared. The next day, only the demonstrations of flower arranging remained to hint at what had been. Skating Permitted Today (Jan. 15) on Carnegie Lake! A friend called to tell me the ice is glorious, deep and dark. Weather looks good at least through Saturday, which should allow people time to find their skates. Check Princeton Recreation Dept. hotline, (609) 688-2054, for details. This photo shows a strange dimpling of the surface. Other photos of the many mysterious patterns locked in the ice can be found at this link. "Summit NJ policy has been in effect for a long time. We lived there until 2003 and either landscapers took the leaves or the homeowner composted or the homeowner took the leaves to the drop off center. Remarkably few bagged their leaves." Though the simplified proposal I put together with some help from friends recommends keeping the loose leaf pickup for 2-3 months in the fall, plus providing year-round pickup of leaves/yardwaste containerized in roll carts and yardwaste bags, the programs that ban loose dumping altogether are worth learning from. What would a year-round ban on loose leaf dumping in the streets mean? Our streets would finally be clean. There'd be no more piles large and small, year-round. Necessity being the mother of invention, people would be more apt to rake leaves into a back corner of the property. These 4-man, three-vehicle, street-scraping caravans would perhaps be needed only for special pickups of brush, or clearing after big storms. There'd be no more noisy leaf-blower operations running amok in the streets. But there are many drawbacks to yardwaste bags as the only allowed container. They lack stability. They are not waterproof, and have to be manually lifted into the trucks, so putting wet, soggy leaves in them is not a good idea. Unlike roll carts, reliance on yardwaste bags offers no potential to expand service later on by also allowing foodwaste to be put in the rollcart with the yardwaste. With foodwaste comprising a third of our trash, any convenient way to remove it from the wastestream will yield big savingsin landfill tipping fees. This approach has been used to good effect in Ann Arbor, MI, as well as western cities like San Francisco, Seattle and Portland. When I speak glowingly (you really need to watch this fun 2-minute video to get into the spirit) of roll carts as a vital component of a yardwaste/leaf collection program, some are skeptical. One concern expressed is that the workers would have trouble emptying the carts, which have two to three times the capacity of yardwaste bags. This is easily solved by retrofitting a hydraulic "tipper hook" on the back of existing trucks, at a cost of $5000 per hook. When compared to the roughly one million dollars spent collecting leaves and yardwaste each year, this is a very minor expense that, by eliminating the need for loose leaf pickup ten months per year, could bring several hundred thousand dollars in annual savings. There've been claims that, if roll carts are to be used for containerizing leaves/yardwaste, the best approach is to spend $250,000 on a brand new truck with an automated hook. This would reduce workers needed to one driver, which could save money over time, but as we can see along Nassau Street, cost-conscious WasteManagement is doing just fine collecting recyclables with two men, plus one of those hydraulic hooks on the back that relieves back stress by doing the lifting. The big advantage of two men in areas of the former borough is that having one worker on the ground makes it much easier to get the carts out from behind parked cars and other obstructions that might be problematic for the expensive new truck with an automated lift on the side. Here's a close-up of the "tipper hook". It has a low profile, and is safe to use. How much would the carts cost? I've heard estimates around $50-60 each. Each one has the capacity to eliminate the need for 150 yardwaste bags/year, which means the cart pays for itself in the first year and can continue serving indefinitely. Roll carts are not only the preferred approach for cost-conscious private haulers like WasteManagement, but also for many yardwaste collection programs around the country. Ann Arbor's program is most relevant because of its similar climate, but also relevant are programs in Seattle, Portland, San Francisco, Durham, NC, and doubtless many other municipalities (Who could forget Enid, Oklahoma, with its rollcart parade video?). The roll carts--with wheels, easier filling, reusability, larger capacity, greater stability, a cover to protect contents from rain, and the potential for large additional savings by adding foodwaste--are a much more plausible alternative to loose dumping than yardwaste bags, which still could be used to supplement the roll cart's capacity. With the carts, council can do away with loose yardwaste pickups for 9-10 months out of the year, and still feel like the town's offering a credible and much more efficient service while stripping away all the negatives associated with loose dumping in the streets. When several of us this past month presented to Princeton municipal council a proposal to change the way leaves/brush/yardwaste are collected in Princeton, council member Heather Howard said that Scarsdale, NY, has also, like so many towns, been struggling with this issue. Turns out that Scarsdale has made a big change. 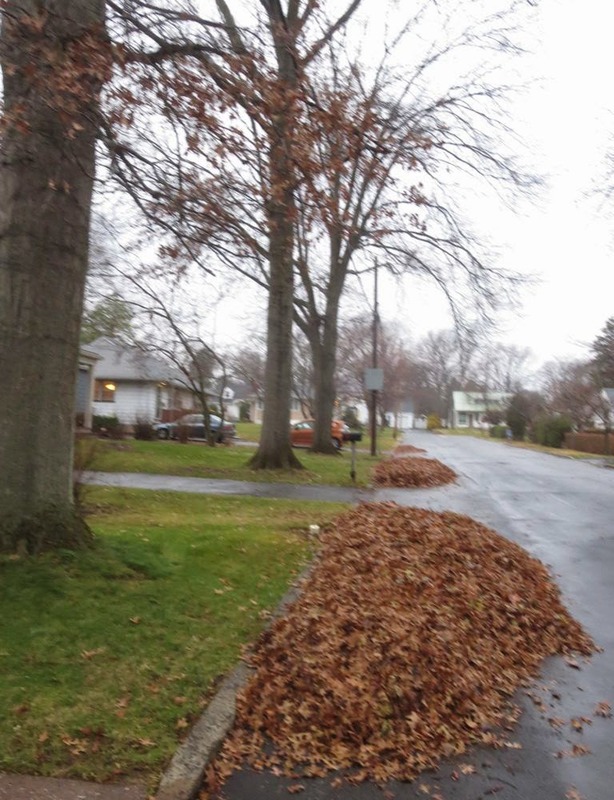 Beginning in 2015, it will no longer be in the business of picking up loose leaves from the curb. Instead, the town will make weekly pickups of autumn leaves only if they're placed in paper yardwaste bags. Residents and landscapers will be able to drop off leaves at a local site, and the town will truck them from there to a composting center. While Scarsdale's program is impressive, there are reasons to question its adaptability to Princeton. The expectations of Princeton residents have been made very high by the year-round pickup of loose leaves/yardwaste/brush traditional in the former borough. Also, Scarsdale's dropoff site may be much more convenient than the Lawrenceville Ecological Center. Though lack of looseleaf pickup would encourage residents to use their leaves in their yards, many residents and landscapers would be apt to take their leaves to the dropoff site. All those little individual trips may not be the most efficient way to deal with leaves. Still, here is info on the Scarsdale program and why they chose to make a dramatic change. This change is driven in part by economics. The $800,000 annual cost of vacuuming up loose street leaves in a town of 17,000 (Princeton's closer to 30,000) every fall competes with other budget needs. But another driver of this change is that leaves can be utilized in people's yards. In particular, lawn mowers can be easily retrofitted with a "mulching blade and deck plate", so that leaves can be ground up and returned to the lawn as fertilizer. The Scarsdale website has a very helpful video that shows the sort of mower retrofit residents and landscapers need to convert their mowers for effective mulching of leaves. Residents essentially have to replace their regular blades with mulching blades available at the hardware store. Importantly, Scarsdale staff are using town parks to demonstrate for residents how to use mulching mowers rather than expect leaves to be hauled away. Princeton's policy in recent years has been a mix. For instance, leaves were traditionally mulched in Potts Park when it was in the borough, but were hauled away last year after consolidation, for no clear reason. Like the Princeton Environmental Commission, Scarsdale recommends the Love 'em and Leave 'em website for more information. A visit to the town website did not reveal any info about brush collection. They may simply provide a convenient dropoff site. The Scarsdale sustainability plan suggests using "Fleetmax software" to generate monthly reports of fuel usage for each employee. Princeton has been struggling to track all the expenses associated with loose leaf collection, e.g. vehicle purchase, operation (including fuel costs), maintenance, staff time, extra passes with the streetcleaner, additional cost of contracting out services that employees could otherwise be performing, lost income from parking spaces blocked by leafpiles, etc. Even if Princeton's "claw" method of picking up leaves is more efficient than Scarsdale's vacuum trucks, Princeton's larger size and essentially year-round loose yardwaste/brush/leaves pickup service likely means an annual price tag of well over $1 million. Those who want to influence the town's priorities this year should get down to the main council room this Tuesday, Jan. 6. Princeton's council members will meet at 6pm in the main council room on Witherspoon Street to hear from the public about goals and priorities for 2015. Princeton's 2014 Council Goals and Objectives can be viewed here. When days are short, it's time to celebrate another home that's using sunlight to feed the grid that powers holiday lights that feed our spirits. 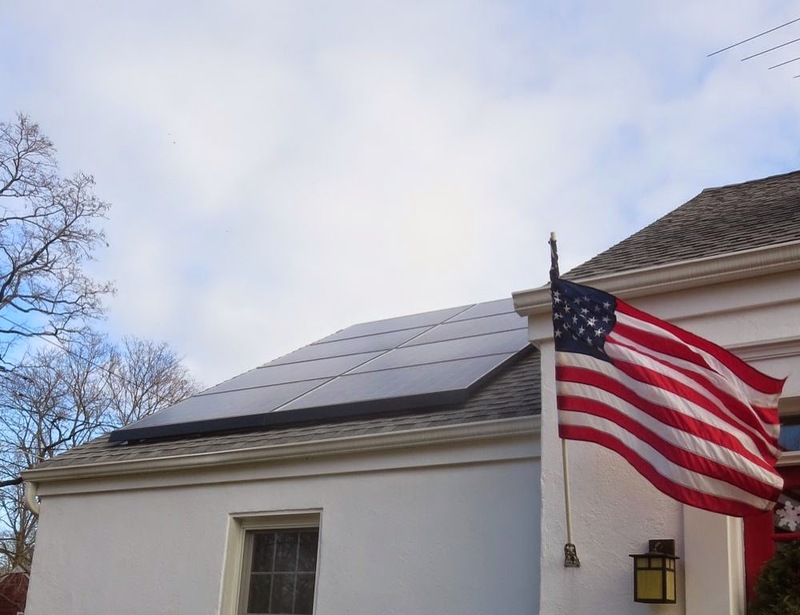 Solar can now be mounted on roofs at no cost to the homeowner. Check it out. And a happy, sun-filled new year to PrincetonPrimer readers.